Born in Germany, Ingrid Oliver spent her early childhood in Kuwait before attending Tiffin Girls’ School in Kingston and then reading Modern Languages at New College, Oxford. On completion of her degree she trained at Arts Educational Schools, London. Inspired by actors including Doris Day, Judy Garland, Barbara Streisand and Julie Andrews, she watched a lot of television and read biographies of Hollywood icons growing up – all of which motivated her to enter a career in entertainment. Following sell-out shows at the Edinburgh Fringe Festival in 2006 and 2007 she and her comedy partner Lorna Watson were commissioned for their own television sketch show (Watson & Oliver) on BBC Two in 2012 which ran for two series. 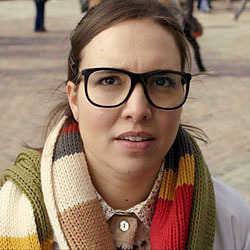 In 2013 she was cast as scientist Petronella Osgood in the 50th Anniversary special of Doctor Who – a role which she reprised in subsequent series starring alongside Peter Capaldi and Jenna Coleman. Ingrid returned to the Edinburgh Fringe Festival in 2017 with a new solo show entitled Speech! which explored the spectrum of political opinion through various character sketches in the wake of Brexit referendum. In 2018 she is starring alongside Anne Hathaway and Rebel Wilson in The Hustle – a female-led remake of Dirty Rotten Scoundrels directed by Chris Addison in which she plays French cop Inspector Brigitte Desjardins. She has also recently finished writing and directing her first short film entitled The Story of Ken and anticipates further directing work in future. Additional TV credits include Peep Show (Channel 4), Lead Balloon (BBC Two), Twenty Twelve (BBC Two), The Increasingly Poor Decisions of Todd Margaret (IFC/More4) and Plebs (ITV). She has also been a regular on many BBC Radio 4 comedies including Recording for Training Purposes, The Castle and Elvenquest. Her film credits include You, Me and Him (2018), 96 Ways to Say I Love You (2015) and Angus, Thongs and Perfect Snogging (2008). Ingrid lives in London and drives a mini with disco lights. She’s also a highly skilled ice skater. Hearing your words like they might be on screen one day is incredible; combined with instant feedback on how the actors liked the layout and used the script direction.